While obviously we all see amazing stuff and want to see it, and all have to start with something simple, but, none of the projects are inspiring and few actually show hints at how a more complex one would work. It would be a little like taking the top 10 best selling books and showing you page 1 only of each with a picture of the cover, and a few pages on the author.. Great but doesnt help you necessarily get much jist of the story. This entry was posted by Liz on Thursday, January 13th, 2011 at 4:40 pm	and is filed under General, General Info. You can follow any responses to this entry through the RSS 2.0 feed. You can leave a response, or trackback from your own site. Thanks for the heads up Liz. I am tempted by too many books, always glad to know when one is a waste. 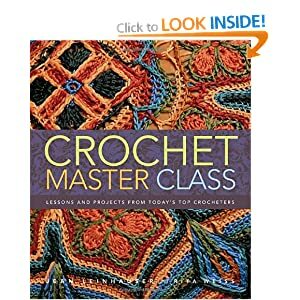 I know a lot of things are personal taste, but something claiming to be "master class" really covers very very little and while it tries to cover fillet, tunisian, irish crochet etc, what it actually gives you to make with it, would be like attending a painting master course, and being given a paint by numbers that has like 5 sections to paint and you're done.